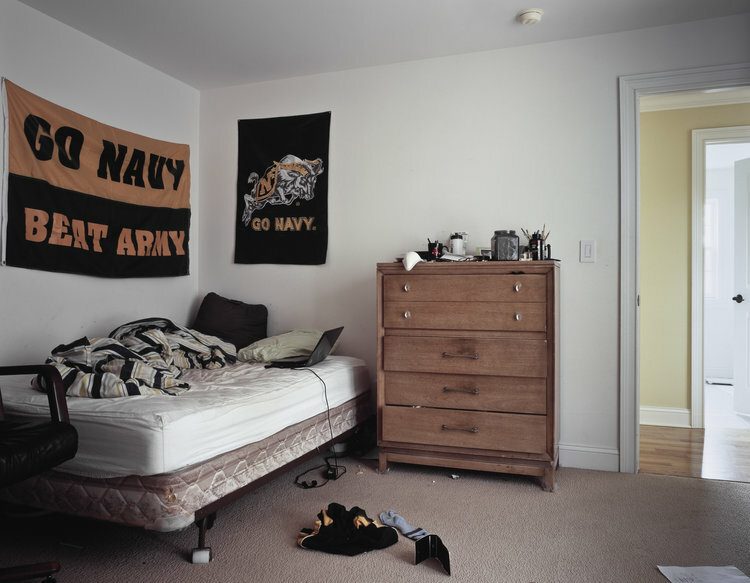 Shortly thereafter, a photo series Dan had been working on for several years was featured onBuzzfeed — large format photographs of the bedrooms of teenagers in the U.S. and Europe. Taking the subject matter beyond the lens of social anthropology, the photos themselves are captivating, elevating what we think we know about the messy lives of today’s youth and their habitats to a meditation on domestic space, identity and home. What could be more perfect for exhibition at the Society for Domestic Museology? For our September opening, Dan conceived of a multifaceted exhibition, the centerpiece of which was a 38" X 31" framed large-format print hung in what I like to refer to as our "main gallery", between the windows in our living room. Accompanying that image was a video piece made for the musician, Meshell Ndegeocello. He then placed 9 smaller images from the same series in our hallway alcove, intermixed with our coat rack and bathroom door. Down the hallway, Dan also installed a complex grid of 4 X 6 photographs, most of which were taken over the summer and reflect his daily photography practice which differs from his approach to the bedroom series. The teen bedroom series grew out of the idea of doing a photo project that would address the fetishization of domestic interior photography — the kind that has proliferated in magazines and social media over the past twenty years. There are endless images celebrating home and design, but rarely are spaces shown as they are truly lived in. We clean up when people come over and we stage our Instagram feeds to present a certain kind of domestic reality. When he approached a friend about taking a picture of her home in its natural state, she demurred but showed him to her sixteen year old son's bedroom, offering it up as a not-so-subtle ploy to shame him into cleaning up. Dan was struck by how much the room seemed to reveal. Everything was hanging out — not just the mess but the various objects and artifacts that project an identity in the process of being created. The photos are taken with a large-format camera, a process that requires a fair amount of set-up and forethought. Unlike my own habit of taking endless digital photos in order to find one good shot among dozens, with large-format photography one is usually only taking a few exposures in any given session. Thus the process of taking each photo becomes it's own kind of performance whereby Dan would arrive at the subject's home, set up his equipment and spend time finding the shot. Though the rooms aren't staged, per se, the shots are not random either. Some kids participated in the process, preparing their rooms and helping with the shoot; others weren't even there. The results are beautiful and formally striking. The balance of color and light and the composition in each photo creates a sense of immersion and presence in these spaces, which are at once familiar but also draw you in to look at every detail. And seen as a series they all work together in a kind of visual harmony, variations on a theme of an evolving personal space. The photos also inspire nostalgia for one's own teenage room and the apparently haphazard yet very deliberate ways we once chose to arrange our space. I found myself wishing I had such evocative documentation of my own room, knowing that each detail would function as a mnemonic device, providing me with clues to a time in my life that feels so far away. As one lovely 16-year-old attending the event pointed out, teenagers' rooms are where everything happens, especially in the suburbs where there is more space to work with. Teens arrange their rooms with just as much intention as their parents decorate the rest of the home, and there's a fundamental tension between what's left hanging out in the open and what's unseen. There’s a similar tension in the project itself, between what we expect from the photos and what we bring to them. All we know about the subjects is their names, ages and where they live. The photos challenge us to read deeply into what the rooms reveal, to fill in the absent residents with our imagination. And yet they defy our urge to read too deeply, to assign greater meaning or intention. During the discussion, there were suggestions to unify the apparently random locations — New York, Chicago, Sweden, — within a broader a cross-cultural study. And there was some frustration that the series lacked a socio-economic focus. But that would be a different project altogether. For now, Daniel intends to continue this series indefinitely to see what else will emerge and, indeed, it would be fascinating to compare a teen room in 2015, with one in 2025 and beyond. While most of the evening's conversation was focused on the photo series, we closed with a viewing of a totally different work: a video short created this summer at a residency through Experimental Film Virginia. Collaborating with two dancers, the film is set to music composed by Dan and represents a departure from his earlier work and the first time working with dancers. The (almost) three minute film is shot in black and white and shows the silhouettes of two dancers as they move in what seems to be an organic and spontaneous response to the music. The film is mesmerizing and notably, wherever you might pause it becomes a beautiful, abstract work in and of itself. It was such a pleasure spending an evening in conversation with an artist who is working on so many projects simultaneously, integrating photography, film and music composition. My only regret is that we didn't have much of a chance to discuss his prolific output of daily photography that was installed in our hallway for the evening. These photographs, organized into a sort of taxonomy of the familiar: cars, cats, food, etc., find what is interesting in the minutiae of daily life, both here and abroad, and create a visual journal that he can revisit and mine for larger projects. At the end of the evening, the ephemeral installation of small photographs came down, but we have the pleasure of continuing to live with the large teen bedroom, at least for awhile. For me, these photos resonated uncannily with the whole idea of Domestic Museology and the intersection of art with living space. Now that we share our apartment with a teenager of our own, we’re confronted daily with the various states of order and disarray, both in her life and her room. And as someone who is admittedly uptight about my living space, who comes home each day and immediately senses disorder, and who (like many people on social media) shares photos of a tidier version of my life that obscures the chaos, Dan’s series hits me on so many levels. Now, when I walk in the door and immediately start collecting the shoes and notebooks strewn about the living room, I look up and see — framed on the wall— a gorgeous photo of a messy room.